This Christmas, wish for a green Christmas. Where flurries of hop flakes blanket the world like you’ve never seen it before. And crunching through crisp, sparkling drifts releases billows of pineapple, citrus and papaya with every step. The reign of the snow angel is over. Long live the hop angel where parks and playgrounds become adorned with the outlines of celestial beings that fell to Earth from angry looking emerald clouds. Tune in to breakfast TV to find life’s on hold for 24 hours as this ’hop day’ demands you rocket down a hill on the back of a baking tray. 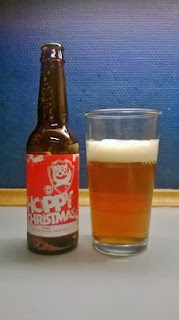 Or simply raise a glass of this festive IPA as we wish you a very hoppy Christmas. Big waft of the 'man from delmonte' tropical tinned fruit, pine and citrus from the pour. Hoppy Christmas pours pale amber orange with an off-white head. Toasty malt on the intake along with grapefruit, clementine orange, apricot, pine and lemon zest while the finish is like sucking on an unsweetened bitter grapefruit with floral hops in the background. Pine, grapefruit and floral hops linger again in the aftertaste. Quite a light mouthfeel to this without being watery and no alcohol shines through. Being very picky this year with what 'seasonal' beer I pick up I can say I am well happy with this one. Lots of flavour, not extremely bitter and very easy to drink, perhaps too easy considering the abv. While not spiced with traditional festive spice which is the case with a huge amount of Danish christmas beer, I would have no problem picking this one up again just for the fact that it is a refreshing change to them brews. If I had one personal gripe with this it is that it lacks a bit of body. Summing up, very nice IPA that is well worth a try if you have not already. This scored a respectable 7.5/10 on the 'so where is the editing features on this phone ?' Beerometer. Where to buy CPH : Fakta.